As a boy, Thomas S. Monson yearned for an electric train. To his delight, on Christmas morning he got exactly that-a train that operated through the miracle of electricity. Then he noticed a second train that his mother had purchased for the boy down the street whose family was struggling. Although it was only a wind-up train, it had a beautiful oil tanker car, which little Tommy wanted for his own. Soon after, Tommy's mother invited him to accompany her to the neighbor's home to deliver the gift. Young Mark was thrilled with his new train and, of course, didn't notice the missing train car. However, a remorseful Tommy did. What happened next will bring the spirit of Christmas into every heart and home. 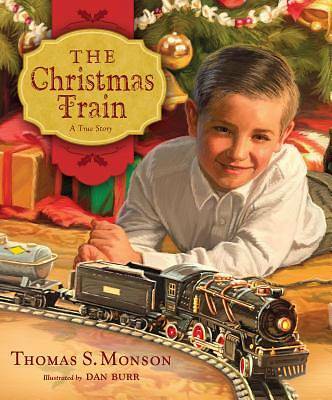 Illustrated by renowned artist Dan Burr, The Christmas Train is sure to be a classic Christmas story and a beautiful addition to every Christmas library.